, an eminent French mathematician, was descended from a family of Jewish extraction, but which had long been convertsto the Romish faith and some of whom had held considerable places in the parliaments of Provence. He was born at Boligneux, in Brescia, in 1640; and being a younger son, though his father had a good estate, it was thought proper to breed him to the church, that he might enjoy some small benefices which belonged to the family, to serve as a provision for him. Accordingly he studied divinity four years; but, on the death of his father, devoted himself entirely to the mathematics, to which he had always been strongly attached. 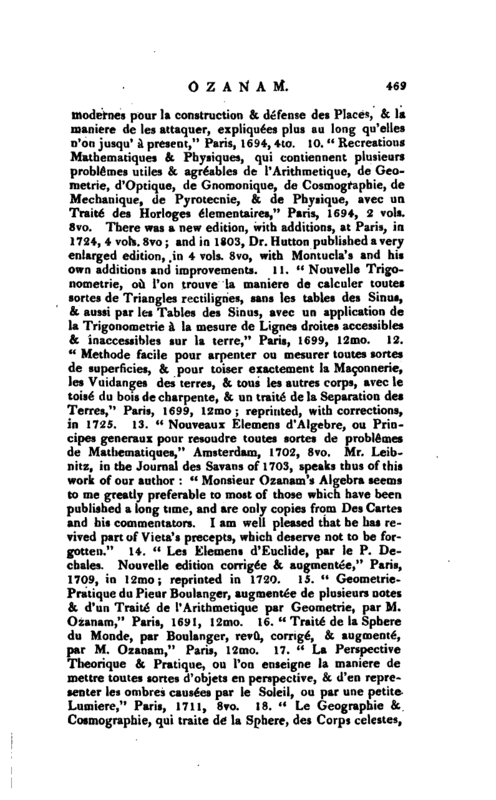 Some mathematical books, which fell into his hands, first excited his curiosity; and by his extraordinary genius, without the aid of a master, he made so great a progress, that at the age of fifteen he wrote a treatise of that kind, of which, although it was not published, he inserted the principal parts in some of his subsequent works. 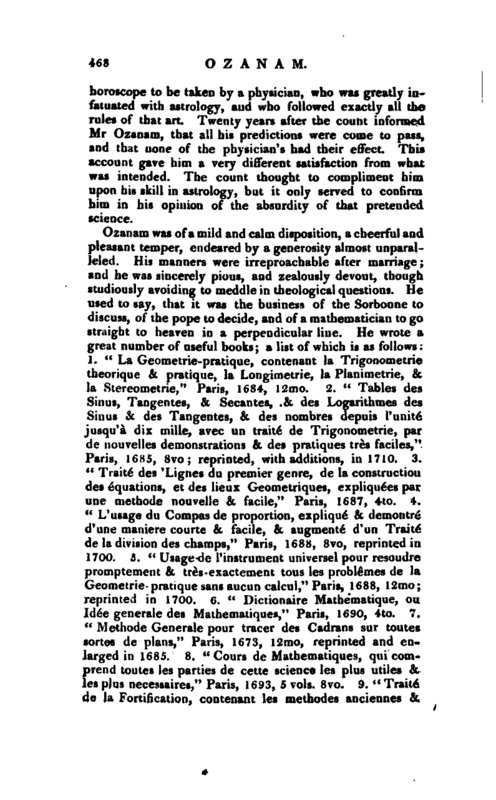 For a maintenance he first went to Lyons to teach the mathematics, in which he had considerable encouragement; and after some time his generous disposition procured him still better success elsewhere. Among his scholars were two foreigners, who expressing their uneasiness to him at being disappointed of some bills of exchange for a journey to Paris, he asked them how much would do, and being told 50 pistoles, he lent them the money immediately, even without their note for it. Upon their arrival at Paris, mentioning this generous action to M. Daguesseau, father of the chancellor, this magistrate was touched with it; | and engaged them to invite Ozanam to Paris, with a promise of his favour. 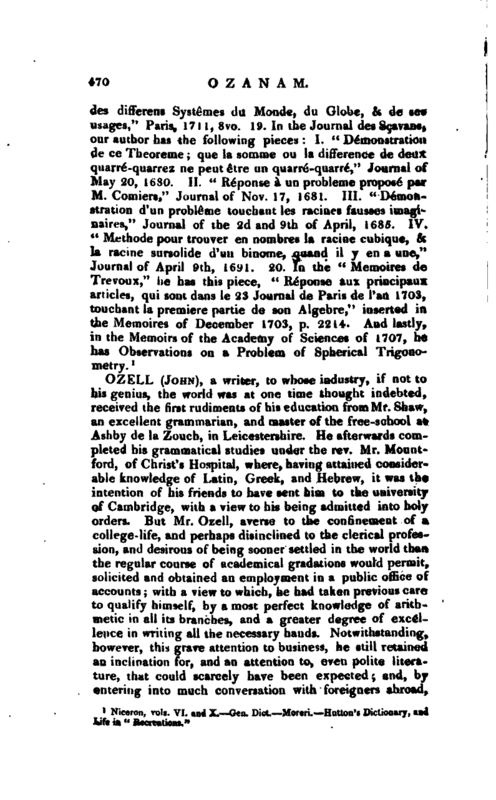 The opportunity was eagerly euibraced; and the business of teaching the mathematics here soon brought him in a considerable income: but he wanted prudence for some time to make the best use of it. He was young, handsome, and sprightly; and much aduicted both to gaming and gallantry, which continually drained his purse. Among others, he had a love intrigue with a woman, who lodged in the same house with him, and gave herself out for a person of condition. 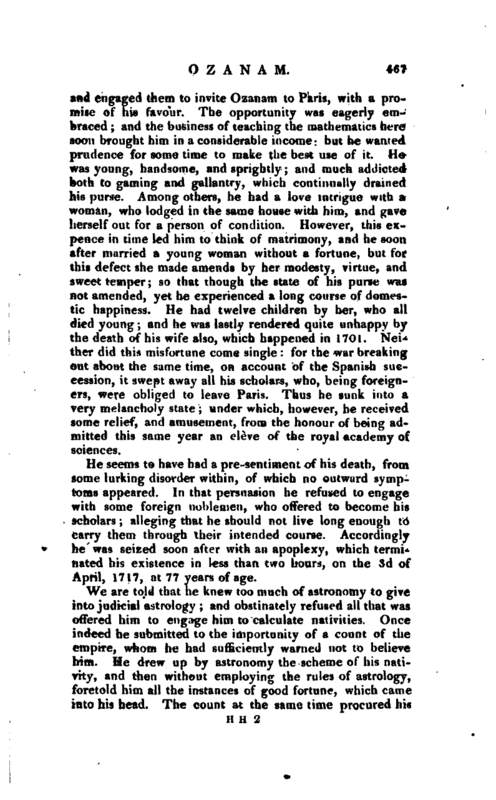 However, this expence in time led him to think of matrimony, and he soon after married a young woman without afortune, but for this defect she made amends by her modesty, virtue, and sweet temper; so that though the state of his purse was not amended, yet he experienced a long course of domes* tic happiness. He had twelve children by her, who all died young; and he was lastly rendered quite unhappy by the death of his wife also, which happened in 1701. Nei* ther did this misfortune come single: for the war breaking out about the same time, on account of the Spanish succession, it swept away all his scholars, who, being foreigners, were obliged to leave Paris. Thus he sunk into a very melancholy state; under which, however, he received some relief, and amusement, from the honour of being admitted this same year an eleve of the royal academy of sciences. He seems to have had a pre-sentiment of his death, from some lurking disorder within, of which no outward symptoms appeared. In that persuasion he refused to engage with some foreign noblemen, who offered to become his scholars; alleging that he should not live long enough to carry them through their intended course. Accordingly he was seized soon after with an apoplexy, which terminated his existence in less than two hours, on the 3d of April, 1717, at 77 years of age. | horoscope to be taken by a physician, who was greatly infatuated with astrology, and who followed exactly all the rules of that art. 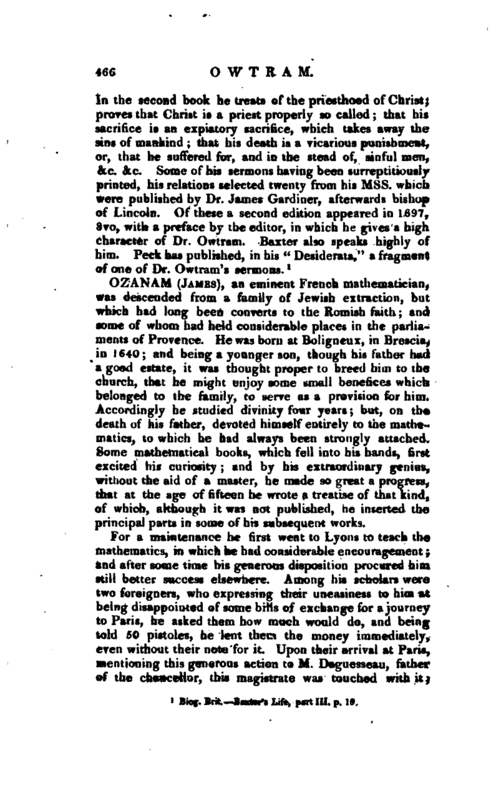 Twenty years after the count informed Mr. Ozanam, that all his predictions were come to pass, and that none of the physician’s had their effect. This account gave him a very different satisfaction from what was intended. The count thought to compliment him upon his skill in astrology, but it only served to confirm him in his opinion of the absurdity of that pretended science.